Lion by Jeff Stone. Book 2 in the Out of the Ashes Series. Review: Have you ever had a passion that you loved, but it turned out to be a complete disaster? 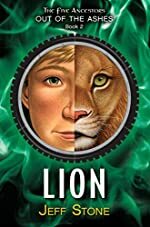 Jeff Stone, author of The Five Ancestors out of the Ashes: Lion, brings a novel about a kid named Ryan with big dreams of biking. However his dreams slowly fall apart, in this action packed book filled with adventure. This book is part of the Five Ancestors out of the Ashes, series. Ryan discovers through a biking accident that his body begins to heal rapidly. He believes the drug, dragon bone, is a performance enhancer. He begins to question what his uncle gave him. As he begins to research the drug, he discovers that the drug dragon bone is connected to a line of deaths. During a visit to his cousin's house, he signs up for a biking competition with his friends. His cousin suddenly is found missing. DuSow, the antagonist, captures Peter and holds him hostage. DuSow suggests that he will let the cousin go if Ryan joins his bicycling team. Ryan and his friends go to the biking stadium to race. Then in the middle of the race Ryan drops out secretly to save his cousin. Will Ryan save Peter, or will DuSow beat him to it? Find out in The Five Ancestors out of the Ashes: Lion.I would recommend this book to a kid or an adult that is interested in realistic fiction. The main character, Ryan, is a dynamic character that demonstrates his bravery by trying to save his kidnapped cousin from DuSow, the evil enemy. This book is appropriate for boys and girls in grades 5th through 7th grade. Readers who are interested in action packed adventure will find this book interesting. The author, Jeff Stone, write a series of books that all has animal related Kung Fu. The book has some higher-level words, but, if you're a high level reader I bet you can read and understand this book if you are in a grade lower than 5th grade. I love this book because of all the action packed adventure about Kung Fu and biking. Jeff Stone writes a series called The Five Ancestors all of the books in the series involve Kung Fu. If you like martial arts and biking, this is the right book for you. We would like to thank Random House for providing a copy of Lion for this review. Have you read Lion? How would you rate it?